Hain’t we got all the fools in town on our side? And ain’t that a big enough majority in any town? The world is in a big rush to abandon feet and replace feet with meters. Why? Let’s see … my dictionary defines a meter as 39.37 inches, and an inch is one-twelfth of a foot. 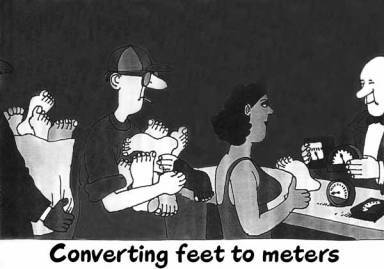 Aren’t we trying to define meters in terms of feet here? Ah! My dictionary goes on to say that a meter was meant to be one ten-millionth of the distance along a meridian from the equator to the pole. Yeah, I can really identify with that. But a meter isn’t actually what it was meant to be. When I looked deep into my inviolable handbook of chemistry and physics, I learned that a meter is 1,553,164.13 times the wavelength of the red cadmium line in air under 760 millimeters of pressure at 15 degrees Centigrade. Now, I positively have an intrinsic feeling for that! And aren’t we using millimeters in the definition of a meter? The whole point of meters seems to be that we can divide them by ten because we have ten fingers. Dividing by ten is something that scientists and engineers do all the time, but they usually have computers to help them do it. Now, sports-minded people don’t usually carry computers around, nor do they need to divide by ten, so they need something they can understand. Like a foot. Now, a foot was the length of some old king’s foot. I can identify with that because my foot is just about the same length as his foot. The best part is that I can see my foot. It is 4 feet away when I am sitting down and 6 feet away when I am standing up. I have a foot. I do not have a meter. A foot is a good measure to use when I am throwing, jumping, running, or climbing. In 1955, the national track and field championships were held in my hometown of Boulder, Colorado. All the kids went because it was the biggest meet ever to hit town. Back in 1955, Parry O’Brien was the only man who could shotput over 60 feet. He came to the meet, and they drew a big line out at 60 feet. Parry whirled, then let out a huge grunt that could be heard across the stadium. The shotput flew and flew. It landed with a thud, kicking up the dust on the 60-foot line. The crowd went wild. For the next week, kids all over town were whirling and grunting. The rocks sailed. We all learned exactly how far 60 feet is from Parry O’Brien. Sixty feet is over in the middle of the neighbor’s yard. You need feet if you are going to have a 60-foot shotput. Back in 1955, no one had high jumped 7 feet. It seemed impossibly high. Seven feet was higher than me and higher than anybody I knew. Imagine jumping higher than your head! John Thomas wanted to be the first person to high jump 7 feet so he painted a big red line around his room at 7 feet to get used to the idea. My room was 8 feet high, and I lay in bed visualizing jumping up and over my imaginary line. You need feet if you are going to have a 7-foot high jump. The four-minute mile is the perfect event. Four laps, four minutes, one mile. The first four-minute mile by Roger Bannister is as well known as the first ascent of Everest. Most of today’s metric track meets still cling to the mile. Why? Because it’s the perfect event. You need feet if you are going to have a four-minute mile. I grew up with all these magic events, and they taught me how long a foot is. The essence of a foot is deeply imbedded in my soul. My trusty Boy Scout pace measures 5 feet for two steps. I can pace off 60 feet to within a few inches, and that is good enough for anything I want to do outdoors. I still don’t know how long a meter is. When I started climbing, I quickly learned what it meant to climb a vertical foot. You had to climb 1,000 vertical feet per hour or you couldn’t go on the trip. I was young and strong, and could easily climb 3,000 feet per hour. If I hit it, I could climb 5,000 feet per hour for awhile. I learned to eyeball a slope, and tell just how high it was. In feet. I learned what it felt like at 14,000 feet. I grew up in Colorado and Fourteeners were magic. I idolized people who had climbed them all. I climbed them too, trying to be one of the elite. I knew all the Fourteener elevations by heart and could recite them on demand. Better yet, given an elevation, I would recite the peak name. The imaginary line in the sky at 14,000 feet separated the chosen few from the rank and file. My goal was to get as high as possible and stay there for as long as possible. You need feet if you are going to have a Fourteener. The scientists and engineers are hard at work trying to impose their fingers over my feet. The USGS maps of the Sierra are already appearing in meters. Gack! In time, the memories will fade and the magic will be lost. There will be no more 70-foot shotputs, 8-foot high jumps, or 4-minute miles. When they replace feet with meters, there will be no more Fourteeners. Feet–and my Fourteener book–will be obsolete. I intend to go out kicking and screaming, but en route, I hope that my Fourteener book will preserve the magic for a little longer. If the Colorado maps become metric, I will rely on my eye and trusty Boy Scout pace, as I march into the mountains mapless. From the high summits, the Fourteeners will still be visible. Since I first wrote In Defense of Feet in 1992, I have received communications from people who completely missed the point. That essay is a humor piece. Recently, I received a hate mail that lashed me to ten masts and whipped me around ten times. This writer’s allegiance to ten was beyond help, and led him to a hate-filled political diatribe. Ten-man, as I call him, actually challenged me to a conversion test! As I read through his lengthy list of conversions, I did them in my head at reading speed. After completing ten-man’s tepid test, I realized that, not only did I learn that 60 feet was over in the neighbor’s yard when I was young, I also learned how to convert English measurements to metric and back again. I went on to work in science for 20 years, and of course used the metric system. As a mathematician, I reveled in the difference between ten to the tenth and ten to the minus thirtieth. I added the conversions between numbers in base 2, base 8 and base 16 to my rapidly growing conversion lexicon. Today, I am at home with feet, meters, ounces, liters, cups, bits, bytes, words, scripts, nautical miles, imaginary numbers, aleph infinities, DOS, OS X, and imperial gallons. I can even drive on the left side of the road. I am fascinated by the difference between Earth’s spin pole and balance pole, and the fact that neither matches the geographic pole. I often ponder the Maunder Minimum, a 70-year period when there were no sunspots, and muse on the possibility that a change in solar activity somehow caused a drought that drove the Anasazi from their cliff dwellings in the 1200s. Not only is the sunspot cycle not regular, the solar constant is not constant, and I sleep better knowing that. I have always been happy with our clock, and smile at the geniuses who have never figured out a base ten clock. We simply don’t need one. In short, I celebrate the complex, diverse jamboree that we all share. How dreary it would be if we all goose-stepped to the same hum-drum. Hitler tried such a system, and the world shouted it down. Let there be many languages! Let there be different cultures, colors and customs, and systems to protect them! Let there be different religions, and a fundamental freedom to explore them all! Let there be diverse opinions, and a system to amalgamate them! Let there be ten-mans and feet-people and a freedom of speech that allows them to explore their mantras! Let there be many mantras, since without diversity, we devolve. And–you knew I was going to get back to this–let there be Fourteeners and a sane system to measure them. Alas, the metric system does not help us here. Let there be feet!